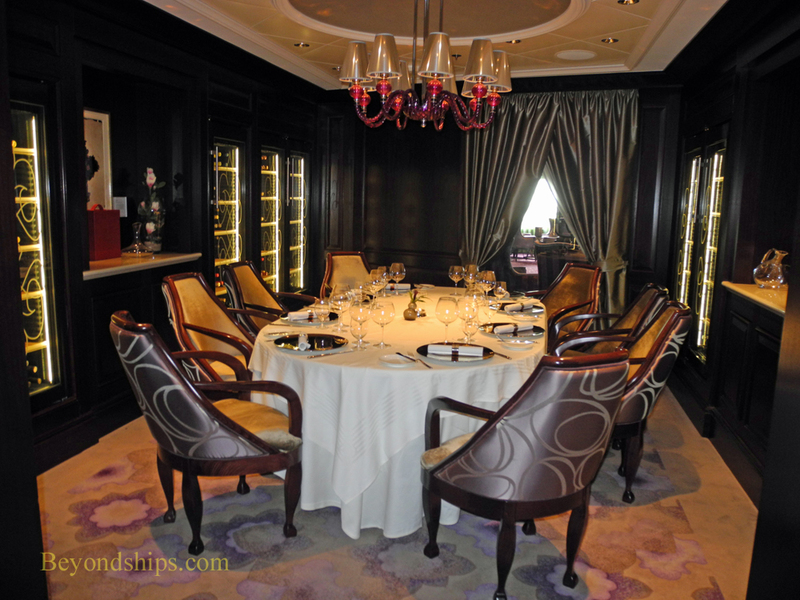 Celebrity's series of Murano restaurants are the most elegant specialty restaurants at sea. In this series, I include not only the restaurants that bear the Murano name on the five Solstice class ships and Celebrity Century but also the restaurants on the Millennium class ships that bear names relating to the great ocean liners of the past. All of these restaurants use the same or similar menus and follow the same approach to the dining experience. By elegant, I mean elegance in the old traditional sense - - beautiful surroundings, graceful tableware, formality and style in presentation. There are many fine dining restaurants at sea but all that I have experienced have an element of informality, which someone has decided has more mass appeal. However, even in this more relaxed era, there is also a place for elegance. This is not to say that the service at the Muranos is remote or stuffy. In fact, I have always found the staff at these restaurants to be friendly and pleasant. But there is a recognition that the focus of the evening is on the meal that you and your companions are sharing. Therefore, the service is deferential and non-intrusive. The Murano on Celebrity Reflection is located on Deck 4, the first of several specialty restaurants located in that section of the ship. It is an intimate venue, not just in size but atmosphere. The dark wood walls, dim lighting and sumptuous furnishings done in shades of maroon are reminiscent of a fine 19th century European restaurant without actually being an attempt to recreate one. In other words, it is a contemporary room with a traditional feel. As noted above, the focus of an evening at Murano is not the décor but the meal. The restaurant offers two alternative approaches. (See menu). You can take the traditional ala carte method or the Five Senses, in which for a set price you have two choices for each course along with a wine pairing. This time, I choose the ala carte approach. 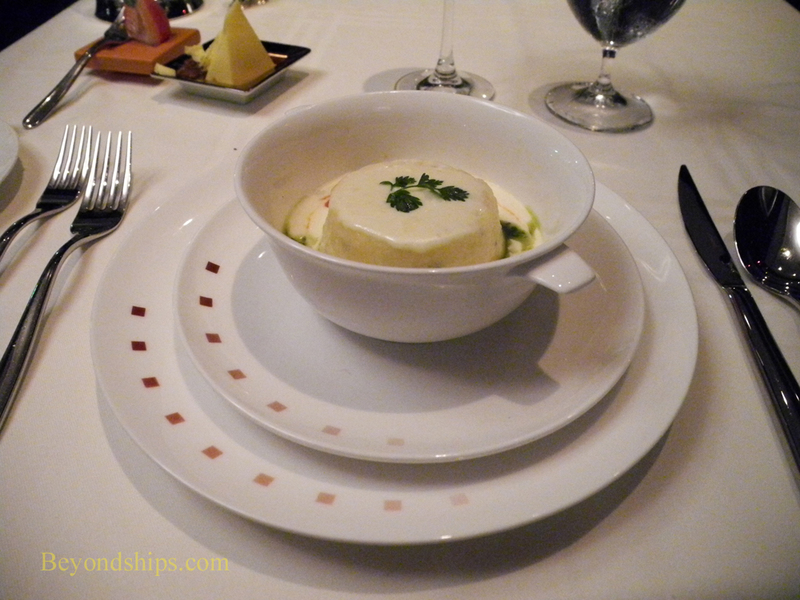 (On Celebrity Silhouette, I took the Five Senses approach and had an excellent dining experience). If you take the ala carte approach, you do not have to chart your own course through the menu. I found the staff quite knowledgeable and willing to give their views on the various choices. This is helpful because even if you have been to a restaurant's counterpart on another ship, there are always going to be differences between chefs even if they are using the same recipes. Rather than go step by step through the meal, I will only discuss some of the highlights. However overall, it was an excellent fine dining experience with beautifully prepared dishes, and excellent presentation and service. I also liked the aromas of the dishes that were being prepared table side at the tables nearby. A feature of the Murano experience that I have always enjoyed is the champagne cart. This vehicle is wheeled from table to table loaded with a number of different champagnes, which guests may order by the glass, and usually arrives just after you have placed your order. This is a nice touch because the champagne is real French champagne, not the bubbling brew guaranteed to cause a headache that is all too often handed out at receptions. These champagnes are made in the bottle, not in a vast vat. They have flavor and individuality. Above: Warm Goat Cheese Souffle. I was somewhat taken aback when the server told me that they no longer offered Pommery champagne. Not the best known or the most expensive of the French champagnes, Pommery is nonetheless a graceful and pleasing wine. It has been a staple in the Celebrity fine dining restaurants for as long as I can remember. Still, its absence was not sufficient reason to throw down the napkin and walk out. One was forced to drown ones disappointment with a glass of Perrier Jouet, a very good but slightly harsher wine. The warm goat cheese souffle, I am told, has been an appetizer on the menus of the Celebrity fine dining restaurants for 13 years. It is easy to understand why it has endured. The saltiness of the goat cheese contrasts with the sweetness of the sauce thus bringing different taste elements into play. For the main course, I had the five-spice crusted venison. Celebrity uses farm-raised venison from New Zealand, presenting it with lingonberry sauce and red cabbage marmalade. Venison is very difficult to prepare correctly and thus a true test of a fine dining venue. The meat arrived exactly as ordered. (Because it is game, it is best served medium rare to avoid toughness). Again, there was a beautiful contrast between the saltiness of the meat and sweetness of the sauce and marmalade. Murano passed the test with high marks. My dessert was an impressive chocolate souffle with a mocha sauce. It was soft, light and not overly sweet. Finally, the cheese course. All too often the cheese course is boring. 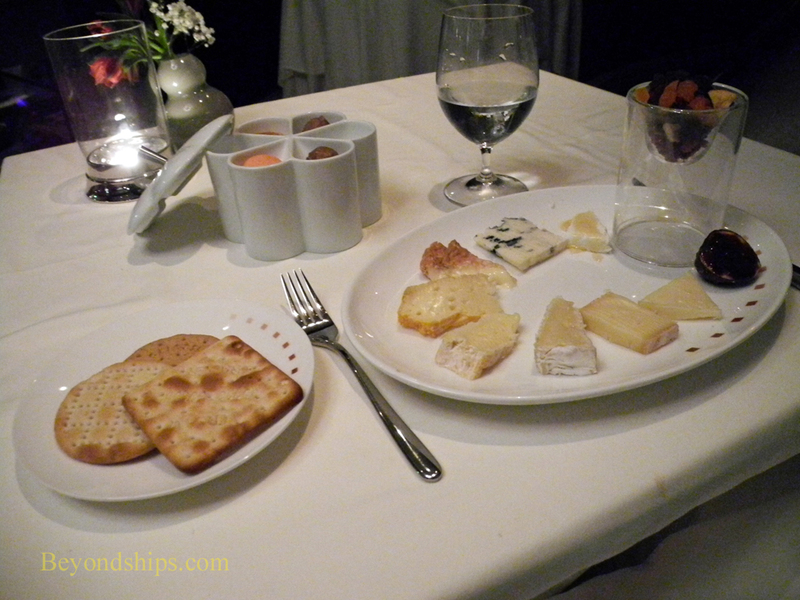 However, this time, the server took us on a tour through France, explaining the differences between the various cheeses and providing samples ranging from mild to strong. It was not only tasty but educational.